They're currently having some Korean soups as their Chef's Specials. I got myself the Korean Rice Cake Beef Broth which consisted of beef cubes, sliced rice cakes, shredded omelette, zucchini, carrots and leeks. 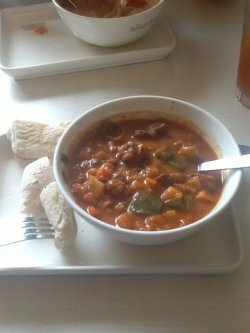 It was a really nice comforting bowl of stew that was healthy yet hearty. A pity that the portion somehow seems smaller than how it used to be. 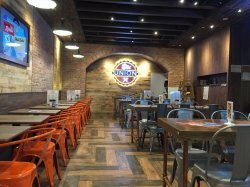 Recently Soup Spoon has opened a new outlet in Vivocity, which is located near the MRT station. 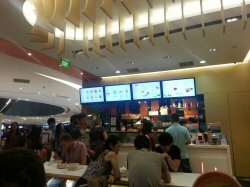 The outlet has menu which is similar to the Raffles City outlet but is much smaller in size. 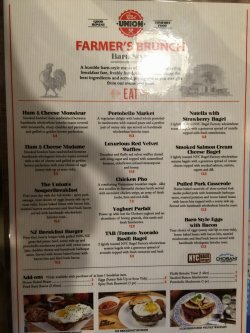 As it is still early, only brunch menu is available. The rest of the menu such soups, burgers and noodles are available from lunch onwards. 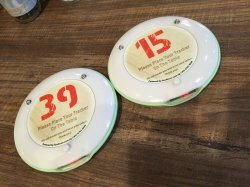 After paying for our order at the cashier, we are given trackers to place on the table. Food will served to us. A vegetarian delight with baked whole portobello mushrooms with roasted pears and a prefect pair of sunny side ups served on handmade wholewheat brioche toast. It is a very filling and delicious one dish meal. The pear is soft and sweet, while the mushroom is big and juicy. Home-baked casserole of slow-cooked fork tender pulled pork with homemade barbeque sauce, roasted potatoes and house baked beans with bacon bits topped with a sunny side up. Served with handmade wholewheat brioche toast. Although it is an ugly mixture, but it tastes quite good. The pork is very tender, with the soft potatoes, it is a very filling meal too. 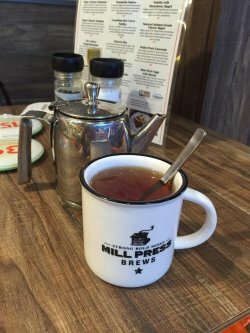 There is choice of English Breakfast, Chamomile Dream, Earl Grey Lavender or Peppermint. Valerie orders Earl Grey Lavender which is served in a metal pot with a metal cup. It looks quite traditional. I have the cooler which is quite refreshing. The cooler is also available in Blood Orange, and Passion Fruit flavours. Overall the food is delicious and filling. Service is fast. I hope that there will be more outlets with brunch available, so that I do not have to travel so far to have brunch. 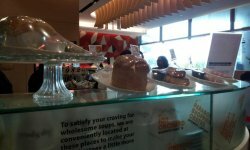 The Soup Spoon opened its first retail outlet at Raffles City in June 2002. They have since created a unique soup culture where soup can be enjoyed as a meal and their aim is to continue making good soups without chemicals and artificial flavouring. What's best is, they do not add any MSG to the soups. It was flavoured by the natural juices of meats, vegetables, spices and herbs. 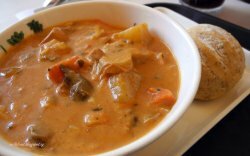 I love the special taste of the soup added with chicken, mushrooms, vegetables, tomato sauce. Mixing the bread with the soup, it was awesome! 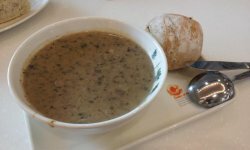 This soup has lots of mushroom inside, for those who loves to eat mushroom, you definitely must try it! I like the cozy environment where my family and friends can gather around the table and chit-chat. Bits of mushroom are quite chewable. There are a wide variety of choices for you to choose from too! Tried the pumpkin soup as well..the taste was really rich at first but when you try to finish the whole bowl of soup you will tend to be sick of the taste as it is too creamy. 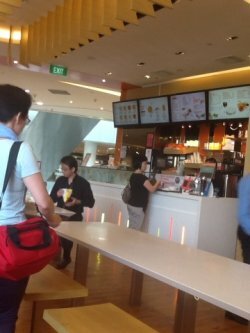 This is my favourite soup spoon outlet.I love the ambience,it is quiet,well spaced and brightly lit. Although there are many types of soups available,i always order my all time favourite tangy tomato soup and top up for a complete meal with masala chicken wrap and iced lemon tea. The tomato soup was in an interesting hue of orange unlike most tomato soups which are reddish based. 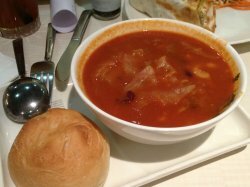 The soup itself is very rich and appetising,i could finish a large bowl of it by myself. 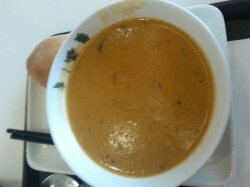 It is a pleasure dipping the complimentary bread into the soup and savouring it. 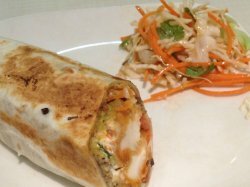 I loves the salad that comes with the masala chicken wrap, it is very fresh and refreshing and great tasting as well. A healthy and fulfilling meal i always have here. 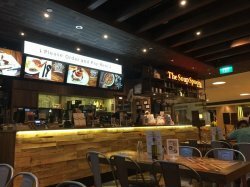 I have visited Soup spoon for a quick dinner before movie as it was just stone throw away from Golden Village at Vivo City. Personally I like the concept here as it's spacious and bright. On top of that,with the high ceiling and orange lighting it gives people a very comfortable and at ease feeling. The bread roll here is soft and warm while vietnamese roll is rather appetizing. Personally i find that the soup here is very filling. On top of that, they are thick and creamy with mushroom bites. Definitely better than a lot of places who are using campbell sorta soup. Nothing wrong with campbell soup but that will only be my option if I am lazy to cook and got nothing else to eat at home. Overall it was a quick pleasant dinning experience here as the staff here are relatively friendly and just as warm as the colour of the deco. 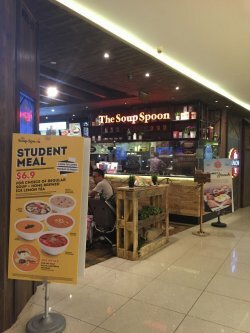 I recommend Soup spoon for anybody who is rushing for a movie and looking for a quick meal. Approximately a 60seater, this Soup Spoon outlet is one of the more affordable joints that still offers a view of the sea, though restricted. 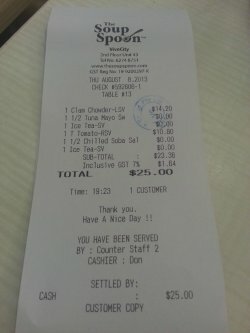 You place your order at the counter, pay on the spot and collect your food as well. Free seating for diners, best seats are the inner right corner ones where there's good lighting and view of the sea. Jazz music is played in the background but generally diners are engaged in casual conversation so the music is kind of drown out. 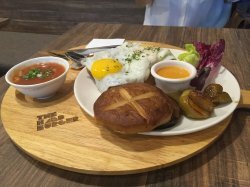 You will collect number stands for some of the side orders like sandwiches and wedges etc but that's a good sign they prepare it on the spot.
. A precooked dish, the ingredients includes beef chunks and carrots. 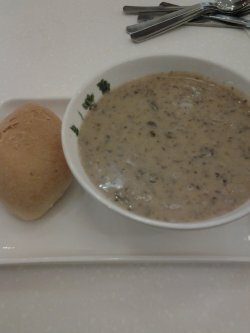 The soup is not exactly thick based like cream of mushroom but it goes well with the bread (choose whole grain or normal) that was served with it. 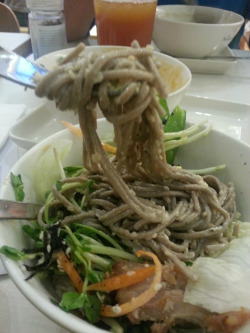 I actually felt it will go well with rice but they dun serve that. Maybe they should take my suggestion. The soup is definitely nice to have while hot. Flavor enhancement is only via the salt and pepper which you can pick up from a side counter. 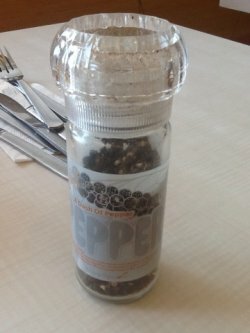 the pepper shaker actually has nice messaging on it about why seasoning is good. Will certainly want to try the roasted pumpkin soup next time.
. It was really good! There was loads of chunks of meat and mushrooms in it, was really filling for me. 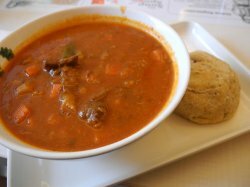 Friend had the beef goulash, it was not bad either! The bread doesn't go as well with both soups compared to mushroom soup though. We ordered the set meal to go along, I had the caesar chicken with mushrooms wrap. Delicious too! Just that I don't really like the salad that comes along with it. 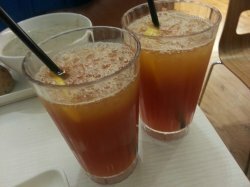 Since it was a public holiday, everywhere was packed especially its restaurant hence we thought of having a quick stomach fix before our dinner and headed to soup spoon as there were ample of seats available.We were given a number stand after ordering and wait to be served.Ice Lemon Tea came as part of the meal. What I like about their tea is that it is not very sweet and quite refreshing.Tangy Tomato with Basil best suits a vegetarian. It is made up of puree from the roasted tomatoes and basil. Since it was a public holiday, everywhere was packed especially its restaurant hence we thought of having a quick stomach fix before our dinner and headed to soup spoon as there were ample of seats available. 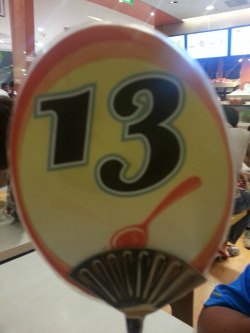 We were given a number stand after ordering and wait to be served. 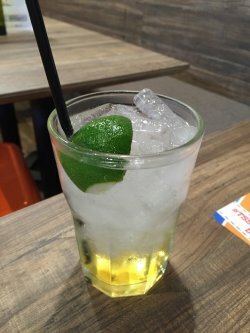 Ice Lemon Tea came as part of the meal. What I like about their tea is that it is not very sweet and quite refreshing. Tangy Tomato with Basil best suits a vegetarian. It is made up of puree from the roasted tomatoes and basil. 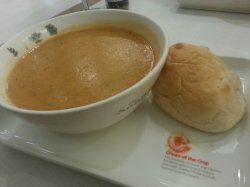 The orangey creamy soup is filled with the smell of fresh roasted tomatoes blended to prefection with a little spiciness. Nevertheless, I still had pepper added to enhance the spice. You will get to see every scoop or spoonful contains generous amount of chunky clams mixed with greens and potatoes. Clams are chewing and the celery had enhance the soup texture witha crunchy bite. 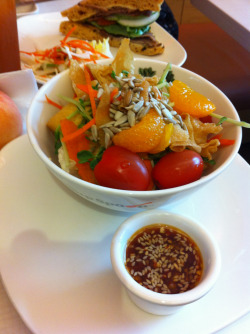 Grilled Soba with Teriyaki Chicken was one of the expensive salad in its menu if one is to purchase solely salad. 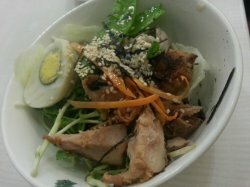 The Teriyaki chicken was mixed with the japanese soba, lettuce, a hard boiled egg, dou miao, cherry tomatoes, snow pea, shredded carrot dressed in sesame sauce. A dish full of fibre and antioxidants. Vegetarian option is available for this too. The tuna mayo sandwich is part of the meal as well. The bread were soft and came with sesame seeds. Altogether, a toothpick had been pierced through this thick sandwich to hold and align them. Total well spent for the night! As usual, I ordered the minestone soup, but for this time I ordered the taco fish wrap and the ice lemon tea. The minestrone soup is as always, bowl full of ingredients – macaroni, carrots, vegetables etc. I just love the rich flavor of the minestrone soup and also the abundant of ingredients. 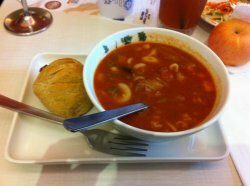 The minestrone soup is the watery type but the taste is rich and with a strong tomato freshness and sourness. Not too sour though. 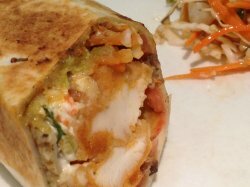 The taco fish wrap is actually fried fish in a wrap. 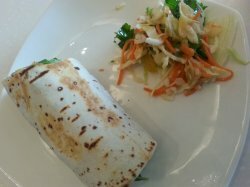 The wrap is accompanied with lettuce and other vegetables like carrots etc. The fish is nicely fried and not dry. 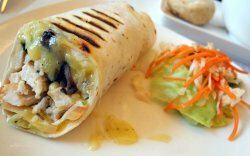 It is quite tender and the flavor is light and goes pretty well with the wrap. However, I do not like the coriander wrapped with the taco fish. Other than that, the ingredients of the wrap are fresh and light. Overall it’s a really healthier meal as they did not use those dressings in the taco fish wrap and the soup tastes like it’s made from real ingredients. I spent a total of $10.35 after a 10% discount I got from using the ntuc member card. It’s the total price of a regular minestrone soup with a complete set of a wrap and a soft drink. Can't get enough, so I'm back here for more of the delicious soup for dinner! It's been long time since I patronize The Soup Spoon, so I decided to have a quick dinner here on the way home. I've always stick to Mushroom or Clam Chower, so I decided to have something different. 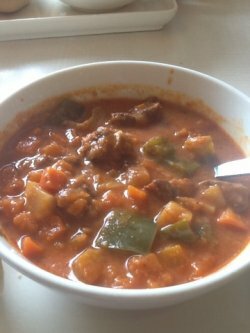 Today's choice - Beef Goulash with generous serving of tender beef, shitake mushroom, red bell pepper, green bell pepper,celery, carrots, potatoes, tomatoes, garlic, onionsI also make it into a meal with Caesar salad & ice lemon tea. It's been long time since I patronize The Soup Spoon, so I decided to have a quick dinner here on the way home. I've always stick to Mushroom or Clam Chower, so I decided to have something different. 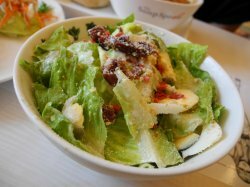 I also make it into a meal with Caesar salad & ice lemon tea. For a healthy post-workout meal, The Soup Spoon has got to be one of the best places for a health-conscious foodie to go! Not only do all the meals have a calorie-count next to them (so that you can make sure you don't eat more than what you painstakingly worked out previously), the "Make it a meal" options range from sinful (cakes and wraps!) to you guessed it, healthy (fruits and bottled water). This is definitely something that "Subway" needs to improve on, because what is the point have having a healthy sub when you're going to pair it with unhealthy sides of soft drinks and cookies/chips?! is the best I've eaten, in my life. I kid you not, this dressing made the salad so much more palatable (because really, a bunch of leafy greens ain't gonna taste very good) and yet was still light and guilt-free. Although it was mostly tofu, the other ingredients included mandarin orange, snow pea sprout, carrot, sun flower seeds and the coveted wanton crisps (yum!) and definitely complimented the tofu. In fact, I have to say, there was more tofu than vegetables in the salad so for all your veggie-haters, this is a good option to get your vitamin and fibre fix without much suffering! The portions was very generous for the price, since I paid around $12 for the entire meal and it was a very satisfying and filling lunch. The only downside would have to be the fact that it was rush-hour and the place was packed with nearby office workers so it wasn't a very conducive atmosphere for a slow lunch with a gym buddy. 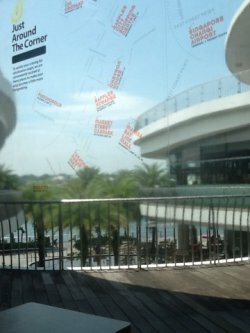 That said, the view of Sentosa and the sea did make up for it, along with excellent service by the staff. 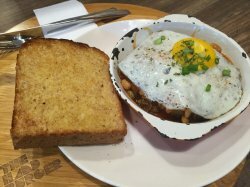 So if you're in Vivocity and wondering what to eat, definitely check out The Soup Spoon. I daresay I'll be heading back to try the other wraps and soups soon! Soup Spoon - My Safe Choice. Whenever my friends and I are undecided where to go for lunch, Soup Spoon (if available) is the safest choice to go for. This was what happen yesterday when Kim Gary was closed for Chinese New Year and we had to seek an alternative in Vivo City for lunch! I must really remember to bring my Soup Spoon card everywhere I go! Their cards cannot be combined. It's really good because for every $10 spent, you earn 100 points ($5 = 50 points) and for every 100 points, you can redeem $1 next time. In summary, 90% discount. Why I like it: Not much physical 'ingredients' but the thick thick mushroom taste really makes me feel very very happy when I eat it! Like you can feel the quality, the saturation of the amount of mushrooms put in to make this. Tangy Tomato is on the sour side for me, while Meatless Minestrone has many many ingredients, including those I don't like (eg. cauliflower). The meat in Simon & Garfunkel is a bit too tough for me, not the tender sort. You can top up $4.80 to make it a meal (ie. + one more sandwich and a drink) but be forewarned, if you're not a huge eater, please don't do that. Don't belittle that bowl of soup, it has the ability to fill you right up for the whole afternoon if you're having it for lunch. 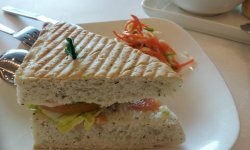 Smoked Salmon Sandwich. 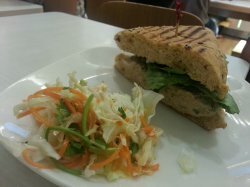 To which this isn't as good as the specialised sandwich shops along Raffles Place but in itself, it's pretty good. 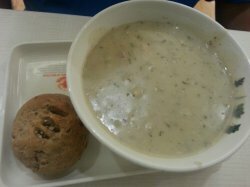 Boston Clam Chowder Soup. The taste is on the 'light side' and not bad. If I were to rank, it'll probably be the second best flavour after Velvety Mushroom! 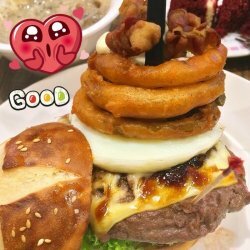 Overall the experience at Soup Spoon is really enjoyable and I'll definitely come back for more (and to use my discounted prices)! What a good marketing strategy.